This interview with Robert Simmon was originally published in Task Newsletter #2. How does one prove the Earth is round? In February of 1966, during an acid trip on a rooftop in San Francisco, Stewart Brand began contemplating the curvature of the Earth. The horizon sloped away from him on either side, buildings refused to stand parallel, and the flat-earth fallacy became viscerally apparent. He was determined to broadcast this feeling, and called for a solution (in the form of a button), demanding, “Why haven’t we seen a photo of the whole earth?” This paranoia-tinged aphorism would lead to the creation of the Whole Earth Catalogue, a highly influential counterculture magazine that described the tools necessary to maintain a sustainable existence. Two and a half years later, Apollo 8 astronaut William A. Anders captured what has been called “the most influential environmental photograph ever taken,” an image of the Earth rising from behind the horizon of the moon. 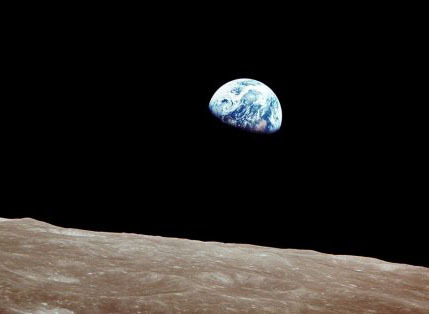 (A) Known as “Earthrise,” this photo was taken in a moment of unscripted curiosity, offering not only a view of ourselves, but a view of ourselves from the alien perspective of another world. What started with a serendipitous snapshot, and possibly an LSD trip before that, has become the driving mission of NASA’s Earth Observatory (E.O.) today. Exploring the Earth Observatory’s website may be the closest thing to holding a mirror up to the entire world; in the depths of this massive archive, vividly colored and hyper-sharpened satellite imagery portray melting arctic glaciers bumping up against shots of urban expansion next to hurricane data and deforestation patterns. 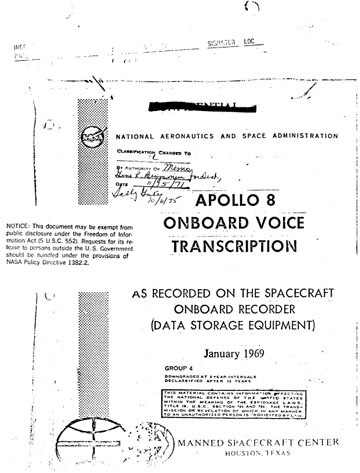 These high-resolution files are precisely annotated and provided free to the public, intended primarily for educational usage. Some images, though, have become ubiquitous in our visual landscape, appearing in commercials, artworks, book covers, billboards, and even the background of your favorite touch-screen phones. Robert Simmon is the art director of the Earth Observatory, and works for Science Systems and Applications, Inc. under contract to NASA. He and his team are responsible for creating these images, which are often composites of astronaut photography and satellite sensory data. In this interview, Robert discusses true vs. false color, accurate vs. effective data, and the art of designing an image to match what people expect versus designing an image that will change their minds. TASK — We are interested in the mission of the Earth Observatory, how these images get used in unexpected ways in culture at large, the E.O.’s relationship to the legacy of Earth imagery from space, and even a little about the design process of creating these images. Robert Simmon — There are a few different missions for the Earth Observatory. The first is simply to make people aware that NASA looks at the Earth (we’re not just astronauts and Mars missions). We’ve also tried to create a site that’s an authoritative source for information about climate change and the environment. Our stories are reviewed by experts, we base the information on peer-reviewed research, etc. We intentionally present a broad overview of remote sensing and Earth science, as a counterpoint to the traditional mission and instrument-based focus of NASA public outreach. Many of our images present the possibility for new interpretations relevant to debates in popular culture, and I personally try to make a “soft sell” instead of beating people over the head with a certain perspective. I present them with something of a neutral tone, hoping that our audience will draw its own conclusions. Since our imagery is predominantly free, it gets picked up and used all over the place. 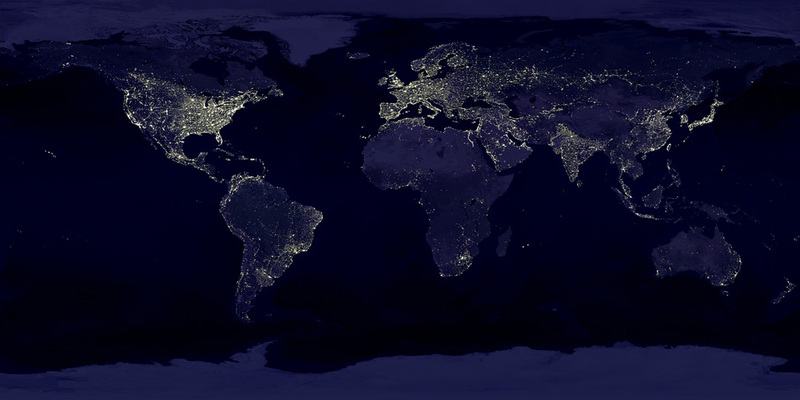 Some images are especially contagious, such as the image of cities at night. (B) I’ve seen this image on magazine covers, newspapers, annual reports, web sites, and elsewhere. I was even on a radio morning talk show once to settle a dispute over whether or not the image was a photograph (it’s not, of course). The second most popular are some of the global renderings. 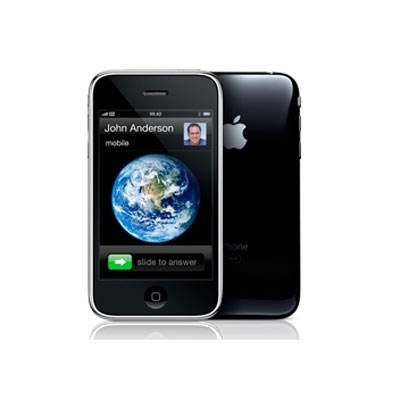 (C) I’ve seen these on ads in bus stops, concert venues, and the default boot screen for the iPhone. With both images, I was simply trying to make an image that lines up with our expectations of what the Earth would look like from space. My design process is very much trying to get out of the way of the data. Inspired principally by Edward Tufte, I try to create graphics as close to 100% data as possible. So a lot of my time is spent removing elements (grid lines, shadows, gradients, etc.) from the default designs of Excel. 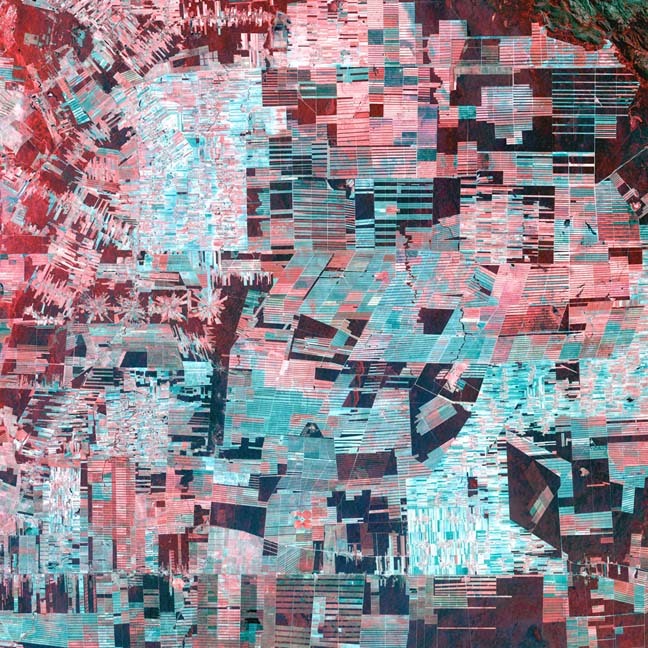 I’m also very careful about color, both in natural- or true-color satellite imagery (images composed of the red, green, and blue wavelengths of visible light), and in maps of data. Our eyes and brains think certain things should look a certain way (clouds should be white, water blue, sand yellow, etc.) so I often need to correct imagery manually. With maps, most of the default color choices, including the very common “rainbow palette,” actually distort relationships between data. Unfortunately, many scientists are used to a certain presentation, so it takes a lot of convincing to get them to approve a change. A side benefit is that many of the more accurate palettes are easier on the eyes, so they invite closer inspection, rather than a cursory overview. I’m also convinced that a very clean, consistent, and polished design is more believable than a disordered and cluttered one, so I spend a lot of time revising designs until they’re just right. TASK — When you said that you often try to make a “soft sell,” were you referring to issues such as climate change and environmental abuse? RS — Yes. It’s a reflection of NASA’s role in setting climate change policy: NASA is not recommending a specific government action, but collecting data and performing analyses so policy leaders can make informed decisions. A good example is our climate change site and Q & A. We try to let the data speak for themselves. TASK — You seem to suggest that the reason the Cities at Night image and the Blue Marble image are so popular is because they are designed to match our expectations of what they should look like. I would suggest that the fact that they are beautiful goes a long way as well, but this idea of dealing with pre-conceived notions ties in closely with ideas of Mundane Science Fiction, such as the “consensus future” — a mediocre version of what we tend to agree the future will look like (think Star Trek). Do you differentiate between these expectation-meeting images and other more abstract images that might show the data more accurately? RS — I think this is an answer to a broader question than what you asked, but “confirmation bias” obviously effects how we interpret imagery. 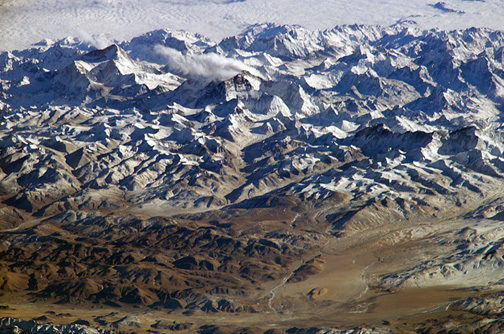 Recently, a climate change “skeptic” (denialist or contrarian are better labels) made his point by selecting a series of NASA images that confirm his preconceptions, even though they are at odds with quantitative analyses of the same data. You can see the discussions here. When dealing with images of data, there’s often a tension between people’s expectations — snow should be white, warm things are red — and accurate/effective representations of data. This is complicated by the expectations of the scientists that I work with, who often have been analyzing data for a decade or more, and are used to a specific presentation. So I have to weigh preconceptions, representational accuracy, and aesthetics, all of which influence the ability of people to interpret a figure. 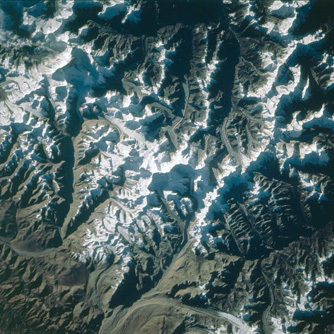 TASK — How easy is it for the layperson to interpret true photographs versus manipulated images of the Earth? TASK — I’m very curious about this caption I noticed on several images: “The image has also been sharpened using the sensor’s panchromatic band.” Could you explain how this sharpening process works, and what the “panchromatic band” is? As a print designer, I’m used to sharpening through Photoshop, based on aesthetic and printing criteria. Your process sounds like there is another level of data-accuracy embedded in the sharpening process. RS — Signal to noise ratio is a critical limiting factor in satellite imaging: the Earth’s surface is a few hundred miles away from the sensor, and there’s a thick layer of atmosphere mucking things up in between. To increase the signal, instrument designers often include a high-resolution panchromatic band, which uses a range of wavelengths (often blue through near-infrared [slightly longer wavelengths than red], although some of the newer instruments use just visible wavelengths) to gather more photons without having to build a bigger telescope. The discrete bands (red, green, blue, etc.) on a sensor have a narrow spectral range, but collect light (more appropriately electromagnetic radiation) over a wide area. 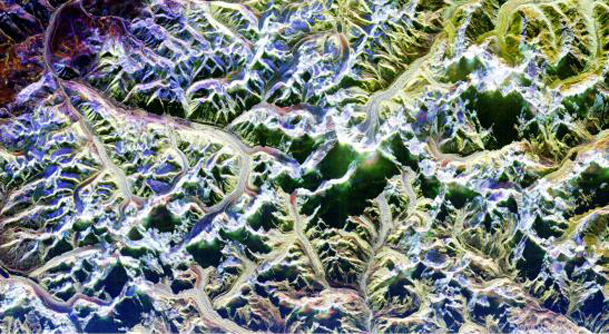 For example, Landsat has a 15 meter per pixel panchromatic band, and 30 meter per pixel individual bands (red, green, blue, near infrared, and two shortwave infrared) plus a 90 meter per pixel thermal infrared band. The visualizer (me) then combines the individual channels into an RGB composite. If I need better resolution to show small features, I need to add in the panchromatic band: hence “panchromatic sharpening.” One way to do this is to do tonal correction and color balancing on an image, and then convert to L*a*b in Photoshop. Then I would load the panchromatic band and adjust the tonal range to the pan-band to match the luminance channel of the RGB composite. Resample the RGB image to match the resolution of the pan-band, and then copy the pan-band into the luminance channel. The problem is that the panchromatic image usually contains near-infrared light. Vegetation is very, very dark in visible light (it’s converting sunlight into energy after all) but very, very reflective in the near infrared —as reflective as snow. Most pan-sharpened images have vegetation that looks seriously awry, so it’s back to the curves dialog to make adjustments. This method gets pretty good — but not perfect — results. Some software uses algorithms based on the specific wavelengths of each band to adjust the pan-sharpened image, but it still seems to take a lot of tinkering, so I don’t mess with it that often. 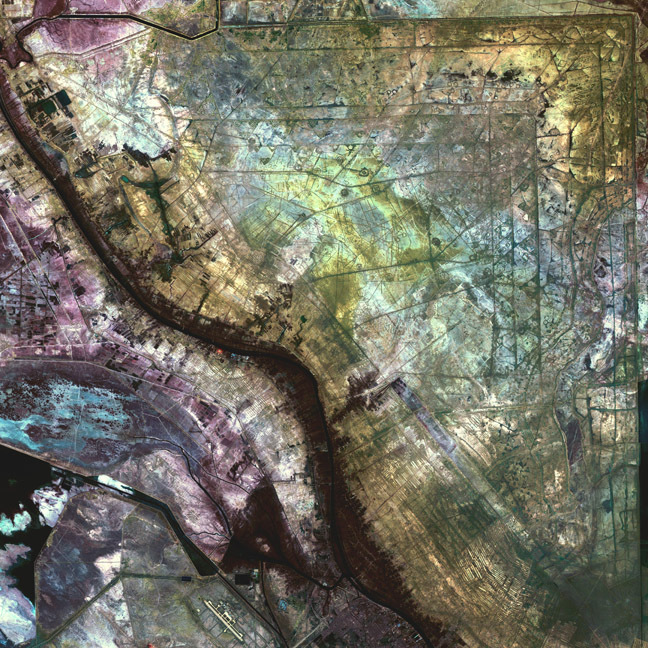 (For example, most of the data in Google Earth is pan-sharpened, and none of it looks quite right). I prefer to stick with RGB imagery, and only do the pan sharpening when it’s absolutely necessary. TASK — You mentioned that it was sometimes difficult to change the minds of scientists. Do you find that scientists have an easier time understanding the principle of “goodness of fit”? RS — My entire design career has been at NASA, and my “clients” are scientists, writers, or public affairs staff. The scientists tend to be entrenched with a specific representation that they’ve worked with for years. I usually change their minds when an image becomes popular, or I can point to a scientific study that validates a method of presentation. TASK — Some of the more abstract images, such as the patterns of deforestation or the fractal-like glaciers, are beautiful simply as compositions. Your primary goal with these images is to accurately present the data, but do you ever consider these compositions you create on a purely aesthetic level? RS — I’m a bit obsessed with the aesthetics as a way to promote understanding. There’s reasonably good evidence that information that we find attractive is also more credible, so I think if I make beautiful imagery, people will understand it better. I also think people are more likely to take the time to study and learn from attractive images. I try to design on two levels: an instant understanding of the main point, plus a deeper level of understanding revealed on closer inspection. Beauty helps move people from a glancing view to longer study. The earthrise photograph has been attributed to both William A. Anders and Frank Borman over the years, both having claimed credit. 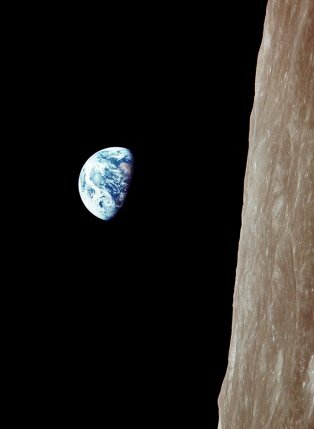 The general consensus suggests that Borman shot the first “Earthrise” photo in black and white, while Anders shot the more popular color version several seconds later. Anders shot the original earthrise image in relation to lunar orbit, with the horizon of the moon oriented vertically, and the earth to the left. As the image became popularized, it came to assume a more traditional perspective with the earth rising from a horizontal horizon. See above(A).